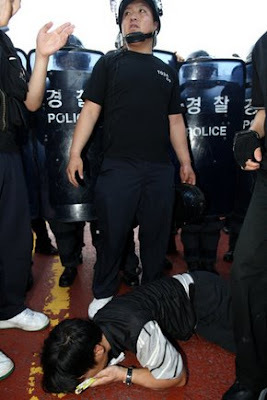 The Korean police, urged on by President Lee Myeong-bak, have escalated their violence against the candlelight vigils. On June 28, according to Hankyoreh, about 300 protesters were injured (against 112 cops) when the police began to trample the crowd. “How can a government that uses violence against citizens who are maintaining a nonviolent tone have the right to say the candlelight protests are violent?” asked Yi Hak-kyeong, an activist and secretary-general of the Korean national YMCA. I take this to be a rhetorical question, for violent states always do exactly that. During the Vietnam War, for example, apologists for US state violence, which killed millions of Vietnamese and injured millions more, would scold the occasional American antiwar protester who engaged in violence on a tiny scale. Mainstream white Americans became quite overwrought about Malcolm X's argument that black Americans were entitled to defend themselves against white violence, since the US government would not defend them at any level. Is self-defense such a radical idea? Yes. It was such moderate statements that caused hysterical whites to accuse Malcolm of espousing violence, though they would not do anything to stop white violence against blacks, which continues to this day. Even the nonviolent Martin Luther King, Jr. made most whites uncomfortable, and as recently as the 1990s a white undergraduate told me that King "used violence." Well, he explained when I challenged him, he used the threat of violence by making himself the nonviolent alternative to violent blacks like Malcolm X. It's true, Americans are astoundingly ignorant about their history, but this kid's statement goes beyond ignorance to vicious distortion. That's the way of the privileged, though. It's not surprising that Lee Myeong-bak and the corporate interests (both Korean and American) he represents are fighting back against the upstart citizens who dared to oppose them. It's not surprising that Lee is furious that he had to back down on his pet projects, which would have enriched so much of his base. How dare mere citizens -- employees of Korea Inc. as Lee sees them -- speak up against their betters? It can now be seen that "democracy" in Korea means basically what it means in the US: the freedom to vote for the carefully vetted rich guy of your choice, as long as you understand that your vote will have no effect whatsoever on policy or practice. Meanwhile, according to the Korea Times, a Korean importer is gearing up to try to dump American beef on the Korean market at low prices. Whether this tactic will move the beef will have to be seen. The candlelight vigils will continue -- and their numbers, according the Hankyoreh article, have jumped back up to pre-June 10 levels -- but now Lee and his new gang of administrators are dropping all pretense of tolerating them. Maybe now progressives worldwide will pay more attention? Does it take heads being broken in the streets to make a protest newsworthy? Students and Grannies and Monks -- Oh, My! Ruling Party, Don't Try Any Tricks!